After This: Mars. Students enrolled in NASA's IMEET Camp had to tackle several technical challenges in their quest to simulate the Mars 2020 Mission. See more photos from this great two-week camp hosted by Georgia Tech Aerospace Engineering. Watch video from the competition. Twenty-five students from 12 Atlanta-area high schools came to the Daniel Guggenheim School of Aerospace Engineering to see if they had 'the right stuff', July 16 -27. 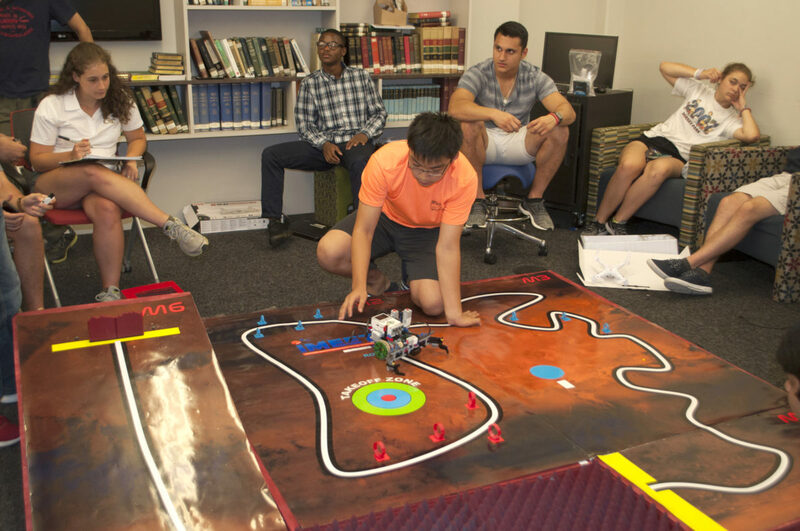 The students, all participants in the NASA Innovative Mars Exploration Education & Technology (IMEET) program, were tasked with simulating a mission to Mars, similar to what will be done in 2020 by the NASA Mars Program. Accomplishing that mission meant they had to take a crash course in aerospace engineering software, hardware, and thinking. Luckily, they came to a good place for all of those things. On July 26 and 27, five teams presented their final projects in front of their fellow IMEET participants and coordinators, AE faculty, friends, and families. One team emerged the victor, taking home some great Georgia Tech swag and a quadcopter. 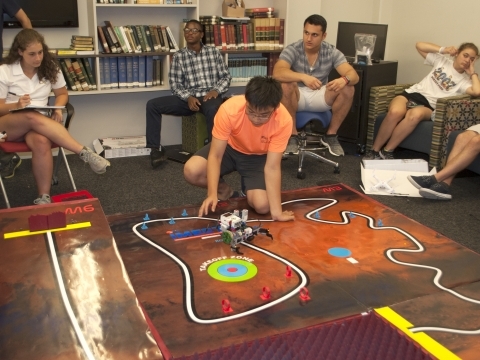 Coordinated by AE professor Dan Schrage, the IMEET camp pairs the aspiring engineers with grad and undergrad students, who guide them through the use of 3D printing, computer-aided design (CAD), unmanned aerial vehicle (UAV) drone design and control, as well as robotics concepts. Aerospace engineering grad students Michel Lacerda and Dongjin Park, and AE undergrads Alexandra Matlack, Richard Stanzione, Soon Keat Ong, Victor Rodriguez, Vijay Narayanan, Scott Nealon, Philip Szot. It also attracted AE alum Jared Churchwell and Robbie Van Zyl - a high school student who attended the camp two years ago. The camp staff judged each team by its drone and ground rover’s ability to complete the mission. The mission was to design and code a rover to complete a winding course, while simultaneously collecting rings (Mars samples) at six checkpoints. All of this happened after their drone dropped off a small beacon and attempted to land on a marked target. 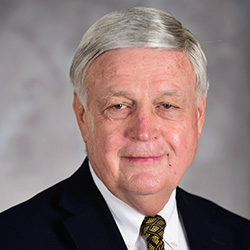 The winning team, announced Friday, was Team 2. All of the teams brought home one important prize, however: experience. “The hardest part for my team was line following. 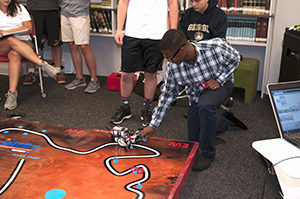 After the rover reaches the beacon (the goal) and drops off the rings, it was hard for us to code the navigation for the rover to find the line again and continue to the next part of the mission,” said Adrian Perry, 17, of West Lake High School. Team five had a different obstacle for their rover. “We had a hard time with our rover’s wheels. We discovered they were lopsided, so we redesigned them and printed them in the Aero Maker Space on campus,” said Maggie Michels, 14, from Duluth High School. In the end, team members had to work together, present their work without a safety net, and problem solve issues they didn't anticipate. We think they did a great job and anticipate many will be walking the halls of Montgomery Knight as aerospace engineering students soon. Sponsored by NASA, the IMEET camps were hosted at several locations this summer, including: Kennedy Space Center in Cape Canaveral, FL ; South Florida Science Center in West Palm Beach, FL; Kent School in Kent, CT; Georgia Tech; Notre-Dame Preparatory High School in Detroit, MI; Coca-Cola Space Science Center in Columbus, GA; Museum of Aviation in Warner Robins, GA; and University of New Haven in CT.
Bragging Rights. 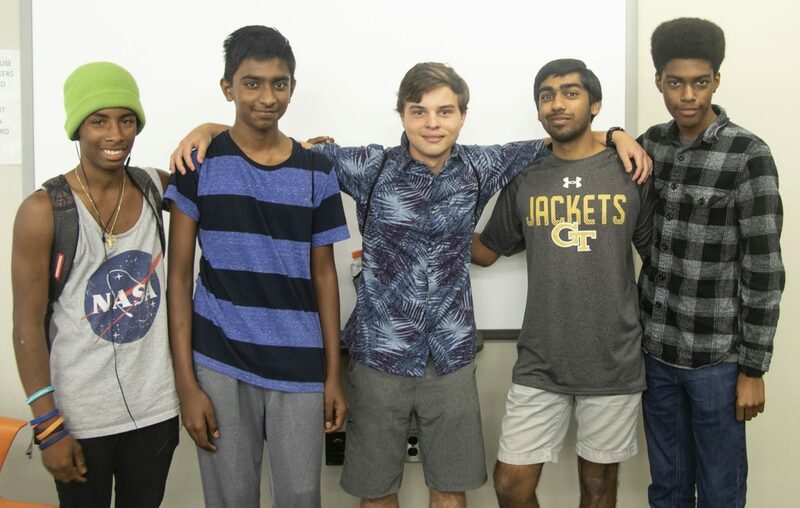 Team 2 will take home some great Georgia Tech merchandise and quadcopters for their own missions, as winners of the IMEET Challenge.